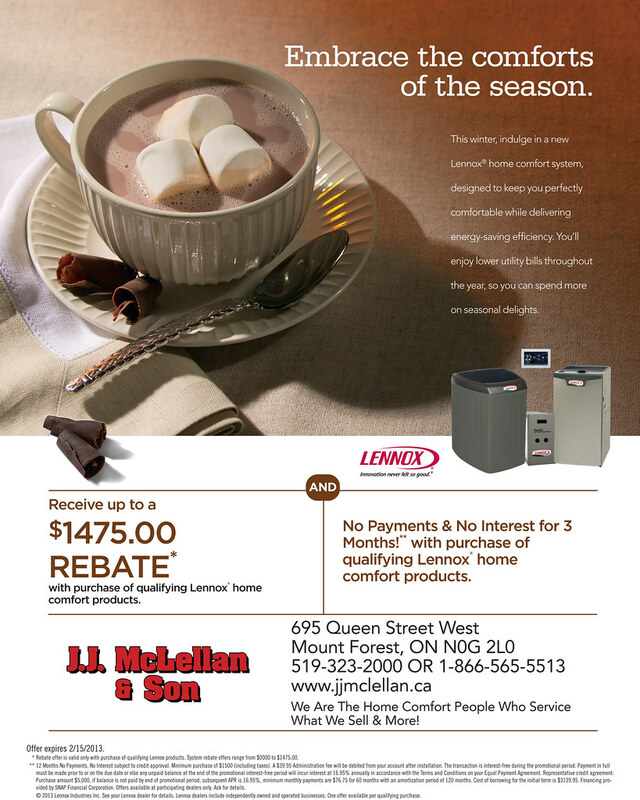 January | 2013 | J.J. McLellan & Son "
Winter Lennox Promotion ~ Save on utilities by upgrading your system! Some people do not realize just how much you can save by upgrading your old heating system! If you think about just how much your system operates for a minimum of 6 months of the year, a couple or few of those months working very hard in the dead of winter. Or how much you could save converting from oil to propane… that is if natural gas is not available to you. Give Mike a call for your no-obligation quote. He will come to your home, measure and then provide you with your options. We also offer financing with the option of paying it off entirely or additional payments with no penalty! Thinking of Home Improvements or Upgrades? Smart Spending & Saving! For anyone, upgrading your home’s HVAC System it is costly, this is a major part of your home. This winter we have already had a handful customers who were in emergency situations to replace furnaces which were unsafe or died, unfortunately we also had some others who we weren’t able to help due such a high demand we had for heating calls or replacements. Our technicians and both Jamie (owner + tech) and Mike (sales) all had a very very busy time of course in between the various flu bugs that were also going around! Make your new year’s resolution to save more money this year. Here are a few steps to get you started. 1. Divy up any unexpected income. When you have a windfall — a bonus, gift, or extra cash for extra work — use the rule of thirds to determine how to use it: • One third for the past. Use one third to pay down debt you owe. • One third for the future. Put a second third immediately into some sort of savings or investment. • One third for the present. Use the final third to make a home or personal improvement or purchase you want. If you follow this rule, you’ll see your debt shrink and your savings grow, and you won’t feel deprived. Lucky for our customers we do offer them financing options that are much more affordable than using a credit card AND gives you the option of paying off as much as you want over and above your affordable monthly payment. I thought of not only myself but also some of our customers who may have had an emergency/unplanned repair or replacement. By using this thirds rule you can not only still make some improvements in your home you can also eliminate part of your debt! At JJ McLellan & Son, We are your home comfort people offering you complete peace of mind for all your Plumbing & Heating Service, Repair and Installations! We service what we sell AND MORE!